With a strong lineup of initial members, amenities such as private office and community spaces, 24/7 building access, fiber wi-fi, collaboration and board rooms, a kitchen and shower spaces, member events, and unlimited coffee & espresso at the members-only coffee shop, I'd say Switchyards is working hard to live up to its hype. "Part workspace, part coffee shop, part event series and part incubator, the Switchyards Downtown Club is a members-only gathering place to cultivate ideas, grow brands, and be around the consumer startups creating the future of Atlanta." Located in the Luckie Marietta District downtown and nestled between two stops on the ambitious Atlanta Streetcar project, the building is a mix of vintage design and modern functionality. The renovation keeps pieces of the building's history intact (the good parts, anyway, not the drop-ceiling acoustic tiles and the particle-board office doors) and harmoniously blends in the new additions. The vibe is creative, invigorating, all collaboration and growth — it is not just what this now-lonesome downtown district once was, but also what it could be again. Tavani has said he started thinking about what physical buildings can do for business ecosystems years ago, but the momentum for Switchyards-as-a-concept (not a building) really picked up when he tweeted about the Flatiron Building going up for sale in 2013. Though the original plan behind that tweet didn't firm up, the fact that there was interest in the general idea took root and eventually came to fruition with the building at 151 Spring Street just this past week (read more here on Tavani's blog about that whole process). Full disclosure: I've been a Switchyards Enthusiast (to coin the official, scientific term) since back in the summer of 2014, when Tavani first began asking for Founding Members to gauge interest. I was lucky enough to get a heads-up on the project from Lance Weatherby, an entrepreneur who really, really loves Internet startups (and has a resume to prove it). At the time, SalesLoft was still teensy and located at the Atlanta Tech Village, and Lance was sharing desk space with us — not to mention his infinite entrepreneurial wisdom and properly made mint juleps. Anyway, he brought Tavani's project to my attention, and I'm thankful he did. It captured my imagination, and I threw $50 at it just to see what would happen (and because they promised a rooftop launch party ... because, you know, priorities). I mean, c'mon, who doesn't like hand-written notes?? So for the next year and half, I watched Switchyards get off the ground and, in the process, do a spectacular job whetting the appetite of the local startup community. From a solid early start in the Atlanta Business Chronicle, to collecting 500 founding members (and sending out "Hustle" stickers and handwritten notes on Switchyards stationary), to a History Atlanta article on the story of 151 Spring Street, they were on top of the game. 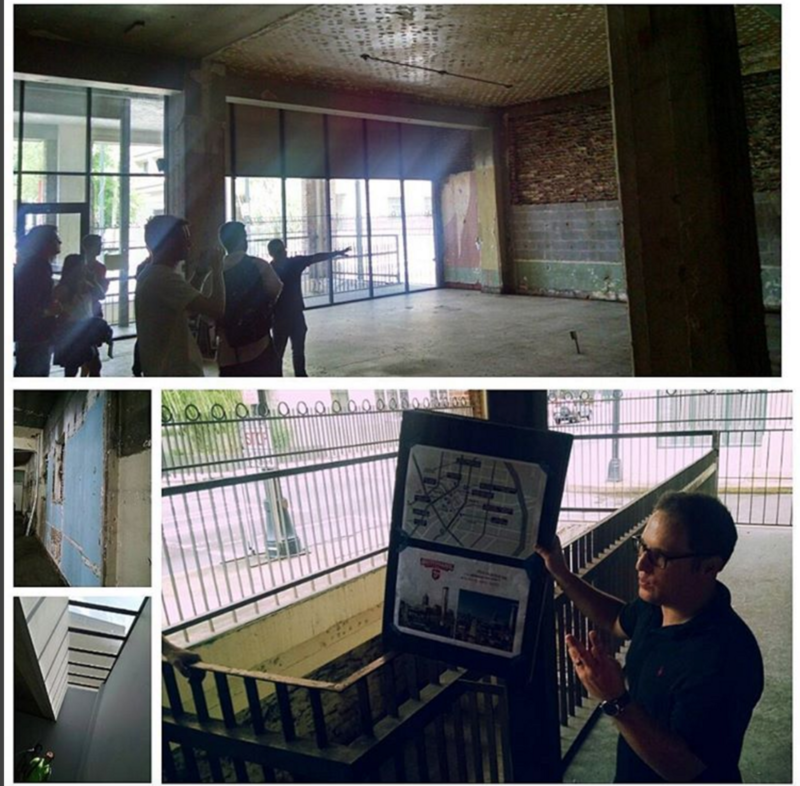 Switchyards tour led by Tavani in August 2015. So many changes from the space when they started! In mid-2015, the stakes went up yet again: Tavani's former Scoutmob partner Dave Payne was named a Switchyards co-founder. This made the third project Payne and Tavani have worked on together, and (probably based on the success of the prior ventures) the buzz only grew louder. Then they started running regular tours of the space as the renovations progressed, and people flocked to it. I went on the tour, too, and it was exhilarating to see the places where the old building started shining through as all of the dreck got cleared away. It almost seemed like the building itself was ... well, growing more hopeful, somehow. The Switchyards team believes building have personalities; they are "fixated on this very fuzzy notion that all kinds of things (like people, places and brands) just have a feel to them." After watching this building take on its new shape, I would have to agree. It feels a certain way when you step in the door, and whether that's due to the building itself, or to the people within it, I don't know. But I like to think that it's both — that this is a partnership between a rescued building and brave people with imagination and dreams. This is a building, and now a community, that's Made with Soul in Atlanta. If this speaks to your soul, join the journey and make something beautiful here.